Visit our online store for fast, easy purchase and booking! Don’t feel guilty about leaving your dogs at home alone all day anymore, enroll them in Doggy Daycare for supervised fun and games with their Doggy Daycare buddies and the Doggy Daycare Team! Activities concentrate on a combination of structured play, mental stimulation and fun exercises within a safe environment. Your pooch will learn healthy social behaviour with other dogs and people, and will be introduced to basic recall and obedience through the games played throughout the day. They will also get fantastic exercise and expend all of their pent up energy, leaving you with a happy and absolutely pooped pooch at home time! Your dog’s safety and welfare is our number one priority, newcomers are monitored closely and we make sure that they fit in and get on well with the rest of the pack. 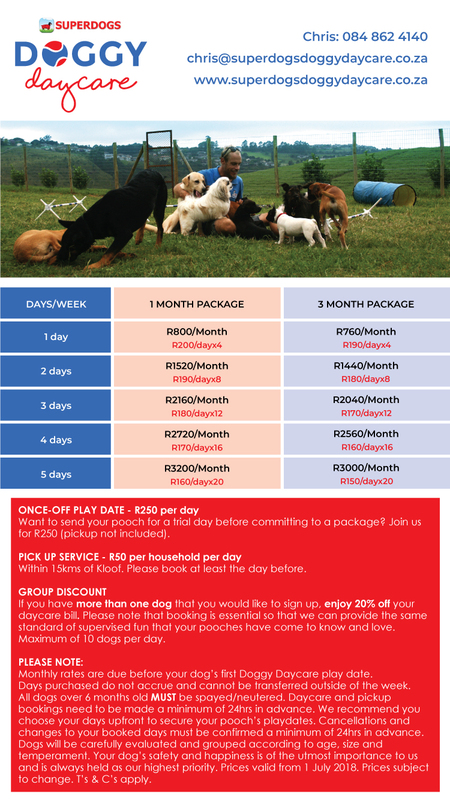 We offer an optional pickup service for an additional R50 per household and if you are sending more than one dog for the day, we offer a 20% discount. 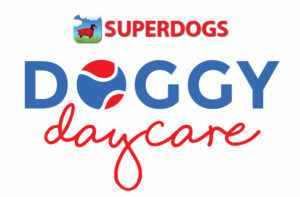 If you are already an active Doggy Daycare member signed up to a package, and your dogs are staying in our Luxury Accommodation, they will be able to attend at no additional cost during their stay.